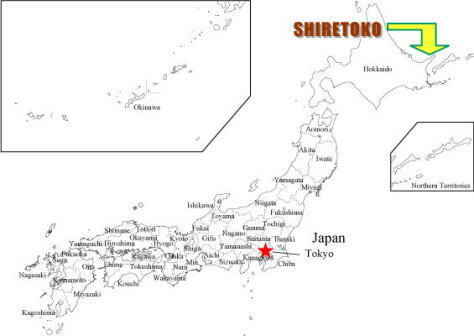 Shiretoko is situated at the cape of Hokkaido. In winter, the ocean is covered by the drift ice. It brings nutrition which nourishes plankton and makes the ocean fertilized. It becomes the food for marine animals (e.g. seal), avian species (e.g. marine bird, Steller's sea eagle) and living beings in the sea. Salmon which coms back to the home river becomes the food of animals in the mountain, and the dead body of animal firtilizes the soil of the forest. This ecological chain connected between sea and land enhances the value of Shiretoko. There live endangered species and rare species such as Brakiston's fish owl and Shiretoko violet in Shiretoko. Big mammals such as brown bear, Yezo deer, Steller's sea lion and seal live in high-density, Internationally rare avian species such as white-tailed sea eagle and cepphus carbo breed. It is also the important place for migrant birds. The diversified environment of Shiretoko from the ocean to high mountain support the variety of living beings by offering the habitat and the food. Followings are the examples of sightseeing spot in Shiretoko. There is 5 km strolling course around 5 lakes covered with the primary forest. On sunny day, you can see the Shiretoko Mountain Range reflecting on the lake surface. This course will be closed when brown bears appear. 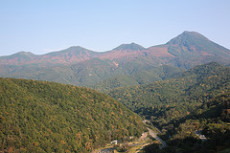 Shiretoko Pass is located on route 334 called Shiretoko Odan Doro (Trans Shiretoko Road) between Utoro and Rausu. The pass is 738m above sea level. You can see the top of Mt. Rausu and extensive forest of dwarf stone pine. You can see Kunashiri Island when it is sunny. The water falls down from a 100m vertical precipice. It comes from the snow and rain fell on the Shiretoko Mountain Range. If you walk 1km, you can find the observatory to enjoy the view of the waterfall. This waterfall's nickname is Otome-no-namida which means the tears of maden. You can see the 50m-tall vigorous waterfall at close hand from the stairs which leads to the halfway-hight of the fall. It is located on route 334. There is a parking, toilets and a suvenir shop. This is the famous view point of sunset and drift ice. It is located on route 334. It is located at the corner of camping site of Utoro Hot-spring Resort. You can see the beautiful sunsets with the view of Utoro Harbor, Oronko Rock and Triangle Rock. Oronko Rock is about 60m high located at the Utoro Harbor. If you go up the steep stairs, there is a flat terrace. You can enjoy the view of the wide coast line and blue transparent reef from there. Information counter gives you various information about the nature of Shiretoko. No visit to the Shiretoko would be completed without experiencing the 12m×20m giant screen presentation of 'Four seasons of Shiretoko', shown at Dynavision theatre that is the only way you can, in just 20 minutes, get an overview of the spectacular vistas, and hidden pristine land experiences not available on any tour. There are wide range of exhibitions from nature to geography, history and industory of Shiretoko. You can understand the past and present of Shiretoko. If you visit this museum, you will enjoy the nature of Shiretoko more. Next to the museum building, there is an outdoor observation park where you see the protected animals from desease and injury such as Yezo deer, Steller's seea eagle and white-tailed eagle. You can see the Shiretoko Cape from the ocean where you cannot walk in. Make sure that when you travel you have your jackets with you as Shiretoko could be cold for you to bear with, you may check online for any discount vouchers so you can save up on your jacket purchase if you still don’t have one for your trip to Japan.